Yes, Bernie Sanders—the self-described socialist—has tossed his hat back into the race for president. This time the senator from Vermont is getting much more support. In fact, Bernie raised a record $6 million from more than 225,000 donors within a day. But he is not the only Democratic candidate gaining momentum. Senators Kamala Harris and Elizabeth Warren raised a combined $2 million in the first day of their campaign. In all, the Democrats have a serious shot at the presidency. And these three leading Democratic presidential candidates pose a serious risk to your portfolio. All three Democratic candidates have endorsed a policy known as the Green New Deal. The bill’s aim is to cut carbon emissions down to near zero by radically reforming the US economy. It also includes expensive social programs such as a federal job guarantee, free college, and universal healthcare. The plan is estimated to cost $6.6 trillion per year. That’s three times more than the federal government collects in tax revenue. It’s also larger than the entire $4.4-trillion federal budget for 2019. So how will all these new programs be paid for? The Democrats are tossing around an idea known as Modern Monetary Theory (MMT). MMT is an economic theory that states a government can print money and spend as much as its needs. This way you don’t need to raise tax revenue or cut spending to fund government programs. So if the US government wants to spend $6.6 trillion per year on the Green New Deal, they can print $6.6 trillion just like that. Stephanie Kelton is one of MMT’s top advocates. No surprise she is also the chief economic adviser for Bernie Sanders. This is a major re-thinking of how governments are funded. But MMT poses one big problem, which even MMT proponents agree on. This policy could create massive inflation. If you print more money that chases around the same amount of goods, inflation will occur. It’s common sense. If the Democrats implemented MMT, they would print $6.6 trillion per year for the Green New Deal alone. That’s more than the entire US national budget! Such extreme measures are more likely than you might think. There’s no other way to fund the Green New Deal. Meanwhile, the Democrats seem to be bent on implementing it at any cost. That’s why the inflation risk is real. And now is a perfect time to take precautions. Before I continue, let me make it clear: I’m not a gold bug. My goal is to find safe yet profitable dividend stocks for my readers. 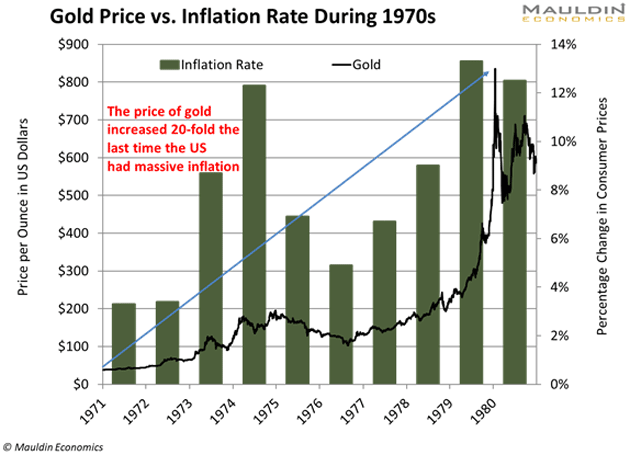 The data shows that gold stocks now offer a compelling value. They are also one of the best time-tested assets to hold in times of high inflation. But while many investors pour into gold miners, I buy a different kind of gold stock that offers better returns with lower volatility. These stocks are known as gold streaming companies. The gold streamer provides money to mining companies and becomes a silent partner. In return, it receives the right to buy metals from the miner’s future production at an agreed price. That’s good for a couple of reasons. First is unlimited upside. When gold prices rise, the streaming company still pays a set price. The company reaps higher profits and so do its shareholders. Second is limited downside. The streaming company is not on the hook for any additional costs. It is immune to the variable costs and risks associated with running a mine. And data confirms it’s a winning business model. When stocks sold off in late 2018, gold performed well. But it’s been no match for gold streaming companies. Since October 1, 2018, the S&P 500 is down 4.9%. Gold is up a modest 11.1%. But my favorite gold streaming company is up 30.1%. That’s more than twice the return from gold, while assuming less risk. 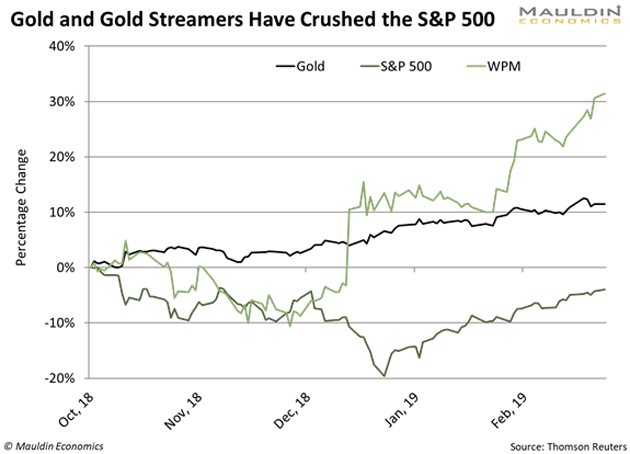 Wheaton Precious Metals Corp. (WPM) is my favorite gold streaming company for a few reasons. The company has one of the most diversified streaming portfolios. This insulates the company from downtime in any single stream. The company also has exposure to other precious metals, including silver. In fact, WPM is the largest silver streaming company in the world. 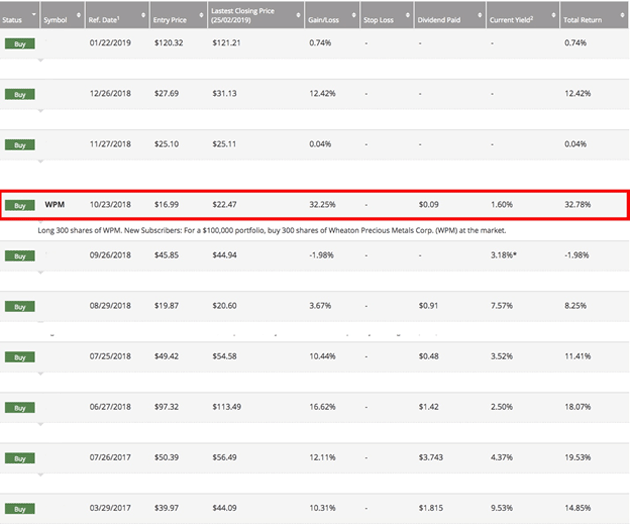 I recommended readers of my premium investing service Yield Shark buy Wheaton Precious Metals Corp. (WPM) on October 23. Since this recommendation, this position is up 30.1%. Compare that to a 2.2% return from the S&P 500. The stock also pays a safe 1.6% dividend. To put it another way, this company allows you to earn a safe, steady income while protecting you from extreme socialist policies like the Green New Deal. It’s a total no-brainer. But this is only one of the many investment opportunities in Yield Shark. Investors need to prepare for potentially out-of-control spending after the next election. The best way to protect your portfolio is with safe stocks like Wheaton Precious Metals Corp. (WPM). Bulletproof your portfolio before it’s too late. If you want a good place to start, download my free special report here.